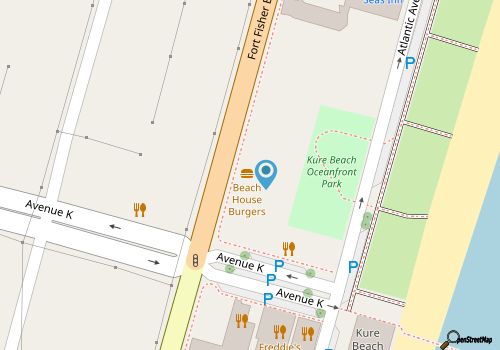 Beach House Burgers is a classic burger shack that’s convenient to visitors who are lounging along the Kure Beach shoreline. Located less than a block away from the oceanfront, this seasonal stand features all the beachy classics, including big-mouth burgers, salty fries, and a couple of southern or coastal staples. The burger stand, though small, is pretty hard to miss, thanks to a lime-green and peach exterior, and a locale that’s just a hop, skip and a barefoot run away from the ocean. The menu is short, but appetizing, with hamburgers and cheeseburgers reigning supreme, and a collection of other classic sandwiches and beach eats, including a fish sandwich, BLT, chicken breast sandwich, chicken nuggets, hot dogs, and bologna. Patrons can top their burger, (or other beach sandwich), with chili, slaw, onion, pickles, or other classic condiments, and can indulge even further by ordering a side of French fries or onion rings. The prices are a breath of fresh air for patrons with little cash on hand, and the limited menu is simple, but oh-so-tasty with nice big portions to satisfy ocean-sized appetites. Completely casual and convenient, Beach House Burgers is a perfectly easy-to-reach spot where beach-goers can fulfill a craving for salty, yummy meals. Call (910) 458-8586 for current hours.